Robert W. Donnelly, Jr. - Dughi, Hewit & Domalewski, P.C. HomeAbout Our FirmAttorneysPartnersRobert W. Donnelly, Jr.
Robert W. Donnelly, Jr. joined Dughi, Hewit & Domalewski in 1980. 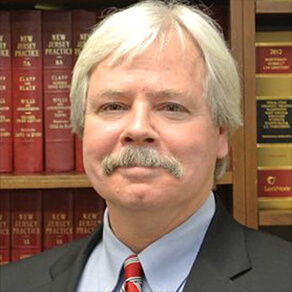 Mr. Donnelly is one of the firm’s senior litigating attorneys, with over thirty years experience in trial work and well over 100 jury trials in the medical and professional liability area. Mr. Donnelly tries cases in federal and state courts and has argued numerous appeals before the Supreme Court and Appellate Division of the Superior Court of New Jersey. Mr. Donnelly has been a lecturer for the Institute of Continuing Legal Education and for hospital groups. Mr. Donnelly is a past member of the American Board of Trial Advocates and the Trial Attorneys of New Jersey and he served as a Barrister with the Union County Inns of Court. He is also a member of the State Bar of Georgia. He was named to the New Jersey Super Lawyers list in both 2008 and 2009. Mr. Donnelly serves as a Director and President of the Dorothy B. Hersh Foundation, a charitable foundation which funds capital projects for the benefit of underprivileged children and young adults.